Manchester City have sent plenty of players up north to Celtic, but never THREE in the same summer – and the Scottish giants are currently linked with a trio of Blues with a former favourite now appearing in the rumour mill. We know that Aussie wonderkid Daniel Arzani is due to join Celtic on a loan deal that could last two seasons once his move to Man City is made official – which it should be imminently with the English transfer deadline approaching. Also being linked with a THIRD Celtic spell is Patrick Roberts has it appears has failed to invite any firm offers from English clubs since talk of him being involved in the Riyad Mahrez deal died out. Former Rangers midfielder Alex Rae told Clyde Superscoreboard that he has heard 21-year-old Roberts could indeed be on his way back to Celtic. “I heard a rumour last week that they [Celtic] were actually going to sign him [Roberts] – it wasn’t a loan deal,” Rae said. And finally, today’s edition of the Scottish Sun has revealed that Celtic boss Brendan Rodgers is monitoring the situation of Jason Denayer, 23, who is expected to leave the Etihad Stadium this summer. 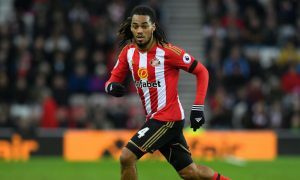 Denayer has been subject to interest from many clubs, but has been holding out for a move to Galatasaray – who want him on a third loan deal. City would prefer to cash in, leading to something of a stalemate. The versatile defender spent his first loan spell away from City at Celtic in the 2014-15 season, partnering Virgil Van Dijk who has since become the world’s most expensive defender. And his stint here ended with a Scottish Premiership and Scottish League Cup medal. It isn’t clear if Denayer, who seems adamant about joining Galatasaray again, would want a return to Parkhead, but he enjoyed his year at Celtic and was named the PFA Scotland Young Player of the Year. “When I came here I just wanted to play some games and take some experience, but now I win trophies and personal trophies so it has gone better than I expected,” Denayer said after his Celtic loan spell came to an end. So that is three potential recruits from City that could join Celtic, with Brendan Rodgers still hoping to strengthen his squad as they look to solve their Champions League dilemma. Three former City players – Dedryck Boyata, Olivier Ntcham and Scott Sinclair – are also currently plying their trade for the Scottish champions.